The magazine’s more recent content adumbrates a broad snapshot of twenty-first-century authoritarianism. Putin’s Russia features prominently, as did Turkey even before July’s events. Other recurring motifs are peculiar to the times we live in, most notably the emergence of the internet as a key battleground in the struggle for freedom of speech. 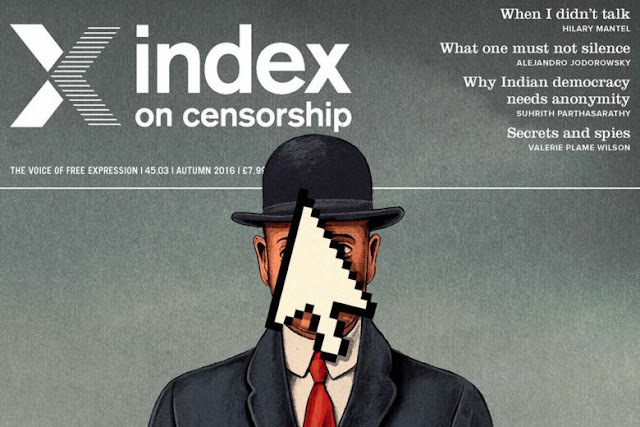 In an article in the Autumn 2015 issue, Index’s contri­buting editor, Jemimah Steinfeld, reported on how the Chinese government’s censorship of online content has grown increasingly sophisticated, with selective curation of search results replacing wholesale blocking of web searches. The role of major Western companies such as Google and Yahoo! in assisting repressive regimes with digital surveillance has been ­particularly contentious. Google’s well-documented complicity with the Chinese government in snooping on dissidents in the early 2000s was especially embarrassing given that company’s much-vaunted ethical credentials. Another increasingly familiar trope is the misuse of anti-terrorism legislation as a means of shutting down dissent – the deliberate conflation of critical journalism with terrorism. Writing in the Winter 2015 issue, the Index CEO, Jodie Ginsberg, recalls that Peter Greste, Mohamed Fahmy and Baher Mohamed, the Al Jazeera journalists who were handed seven-year prison sentences by the Egyptian government in June 2014, had been charged with terrorism offences: they were convicted of “spreading false news” and collaborating with the Muslim Brotherhood. If state repression remains the single most important barometer of free speech – Freedom House’s annual Press Freedom report says 46 per cent of the world’s population live in “Not Free” media environments – the role of non-state actors is also increasingly pertinent in a world rife with racial, religious and national chauvinisms, and their attendant ­proclivities for mob violence. A world away from the machete-wielding zealots of Dhaka, in the genteel environs of North American university campuses, free expression finds itself under threat, not from the religious Right, but from activists in the progressive camp. The discourse over “trigger warnings” in academia was initially concerned with ensuring that conversations touching on the subject of sexual assault could take place in a manner that showed due sensitivity to victims of abuse and trauma. But it has taken on something of a life of its own, and a vociferous minority is even advocating that the English Literature curriculum be reconfigured to reflect contemporary values, expunging from the literary canon anything that might be upsetting on grounds of gender or racial discrimination. Many on the liberal side of the spectrum have deep misgivings about this movement. Their objections are summed up in Greg Lukianoff and Jonathan Haidt’s widely shared August 2015 article in the Atlantic, “The Coddling of the American Mind”, in which the authors decried what they saw as an institutionalized hypersensitivity to political correctness on the contemporary American campus. They argued that the campaign to turn campuses into “safe spaces” – privileging the presumed psychological fragility of students over freedom of speech – amounted to a culture of “vindictive protectiveness” that was creating an oppressive climate “in which everyone must think twice before speaking up, lest they face charges of insensitivity, aggression, or worse”. One recent controversy illustrates this dilemma quite vividly. In April 2015, when PEN America bestowed a freedom of expression award on Charlie Hebdo, a number of prominent authors – including Michael Ondaatje, Teju Cole and Rachel Kushner – withdrew from a gala dinner in protest. They objected to the canonization of a publication that, as they saw it, had for many years made a lucrative sport of goading and bullying a marginalized minority in the name of satire. Freedom of speech, they argued, is qualified by an obligation to use it in a responsible and decent manner. These were youngish, progressive writers, rather more attuned than the older ­literary stalwarts to the nuances of structural racism and power relations, and therefore more inclined to think critically about the outpouring of rhetoric that followed the Charlie Hebdo atrocity. They may well be on the right side of history on the question of France’s treatment of its Muslim citizens, but their stance is at the very least deeply problematic. There is a hinterland where acute sensitivity and intellectual intolerance intersect, and the burgeoning of a culture of grievance – whether in academia or in wider society – is likely to have serious implications for the free and open exchange of ideas in the future. The poet and novelist Stephen Spender, who was heavily involved in the founding of Index on Censorship, wrote in its inaugural issue of the “risk of a magazine of this kind becoming a bulletin of frustration”. Peruse any individual issue and it can, in truth, feel a bit like that at times. But when one considers the publication’s back catalogue as a corpus, seen in historical context, its worth is hard to deny. It constitutes an archive of past battles won, and a beacon for present and future struggles.